Like most gardening methods, there is some controversy among gardeners about using fertilizer stakes. 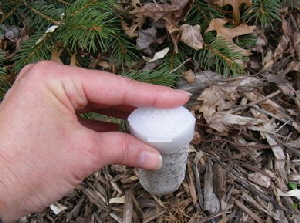 But properly used, fertilizer stakes are an efficient way to feed your large evergreens and trees. I have a lot of large evergreens, 16 I think, ranging from 30 to 50 feet tall. It takes a lot of fertilizer to keep them healthy. For feeding most things I prefer using compost or organic amendments so the plants can feed over time as they need it. But I would need compost by the ton for all these evergreens. Fertilizer stakes are simply compressed, slow release fertilizer, that is formed into a spike for easy insertion into the soil. Pounding fertilizer stakes into the ground each spring is a simple way to accomplish slow release feeding for the year. Rain runoff won’t wash the fertilizer away and my evergreens have grown vigorously and lush. Fertilizer stakes are available specifically formulated for large evergreen shrubs and trees, for deciduous trees, for smaller acid loving shrubs and for flowering shrubs. You can even get small ones for potted plants or formulated for tomatoes. Since I prefer organic feeding where possible, I only use them for large evergreens and large deciduous trees. And with “organic” being in high demand now, you can also get organic stakes, but be aware that the term organic is often very loosely applied. You don’t need to buy expensive name brands, they are formulated pretty much the same no matter who makes them. Once in a while I can get a pretty good price on name brands at WalMart or Home Depot. I prefer to buy in bulk, you can usually find them in big bins at farm and feed stores, or order a case from an online tree nursery. If you prefer an organic they will usually be more expensive. Pound them in early in the spring when the soil is still moist or a day or two after a soaking rain so they go in easily. This is one chore you can’t do too early, the fertilizer will be there ready when the plant needs it. It is very important that the soil gets watered periodically to release the fertilizer. Some of my evergreens are densely planted in a far corner of the property. Because they are closely planted it takes a heck of a rain to soak the soil and lawn sprinklers do not reach them. So I do need to make a point to put a soaker hose or shower sprinkler out there once in a while. But then they need the soaking regardless of the fertilizer. It is also important that you do not insert the fertilizer stakes too close to the roots, which could cause root burn. As directed, install them in the drip line of the tree, or with evergreens outside the outer edges of the lower branches. Most packaged spikes advise using the spikes twice a year, in spring and fall. I don’t encourage growth for any of my plants in fall, and I have found that one spring application does just fine as long as I use enough stakes (follow the package directions for how many per inch of trunk). Some gardeners claim that using fertilizer spikes does not evenly distribute the fertilizer, causing uneven growth. Perhaps if you put the spikes in the exact same spots every single year it could be possible, but I don’t agree. And when I put the spikes in it is a very random process of starting point and distance apart. As the trees get larger I generally am using more each year. And I also have faith that roots do their job. They simply take up water and nutrients and distribute them where needed in the plant. Place one of the caps on the flat end of the spike to prevent the spike from cracking when you pound it in. Position the pointed end of the spike where you want to insert it and press into the soil slightly. Pound the stake down into the soil, I prefer a hard rubber hammer head to minimize the possibility of cracking or shattering the stake if the ground is not good and soft. You may get some cracking, in which case I proceed a bit more carefully. When the cap reaches the soil you need to pull it off before it gets buried too deep to remove. There are notches on the cap to help pull it out. Once the cap is removed, give the stake one last hit to bury it. Once in a while a stake shatters. Not much you can do then but just pound the pieces in until it is all buried. It is pretty much pulverized at that point, but it is in the soil. That’s all there is to it, and your trees and evergreens should be good for the season.